If users are creating queries in Prod (say, in a non-transportable namespace), regenerating them in Dev is cumbersome & error prone. Smart QCopy can help. You want to phase out InfoSets but several queries exist on them. Standard Query Copy tool does not work with InfoSets. Smart QCopy can help. You want to delete unused queries (one time, obsolete & wrong Queries). 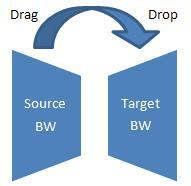 Smart QCopy allows a taking a backup of them, so that they can be deleted from Prod & transported back when needed.